Adelaide, Australia (CNN) Halfway up Mount Lofty, a squat, scenic mountain that overlooks the Australian city of Adelaide, Badiucao is uneasy. Even for a millennial, Badiucao — he uses a deliberately nonsensical pseudonym to protect his identity — is tied to his phone. 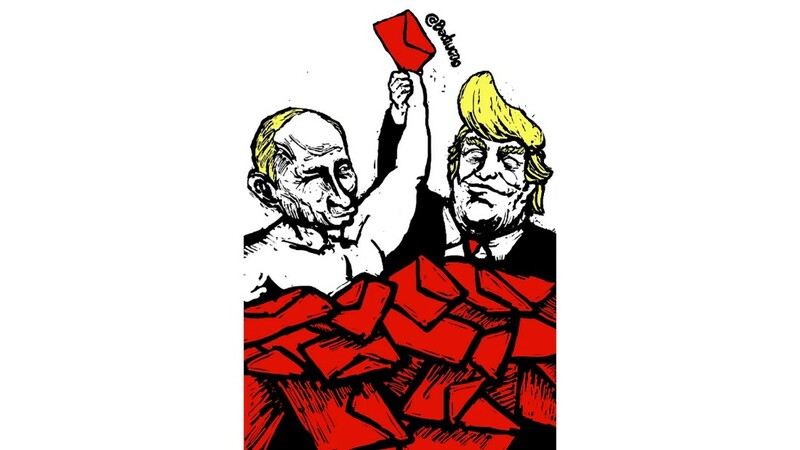 With it in hand he is constantly checking Twitter, staying connected with China thanks to a non-stop stream of posts from journalists and fellow dissidents. After almost seven years in self-imposed exile in Australia, more than anything else he fears being cut-off from his homeland, becoming another irrelevant overseas critic fighting yesterday’s battles. 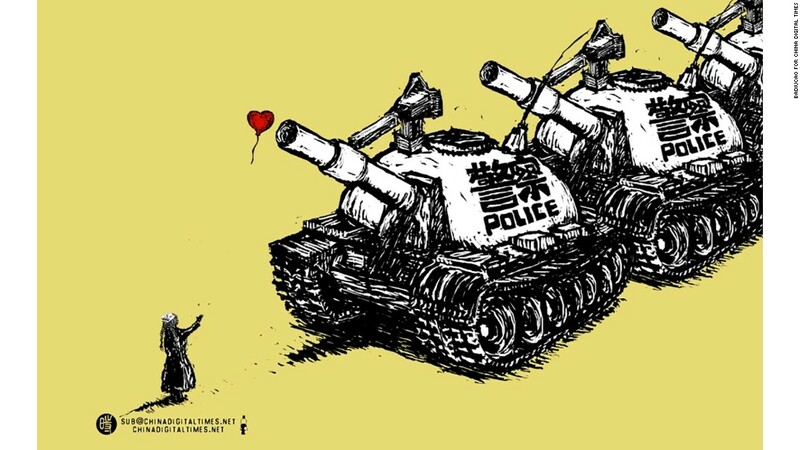 “Around 2010-2011 when Weibo was becoming very active, it was a relatively free medium, and a few cartoonists became popular,” said Sophie Beach, editor of the US-based censorship watchdog China Digital Times. 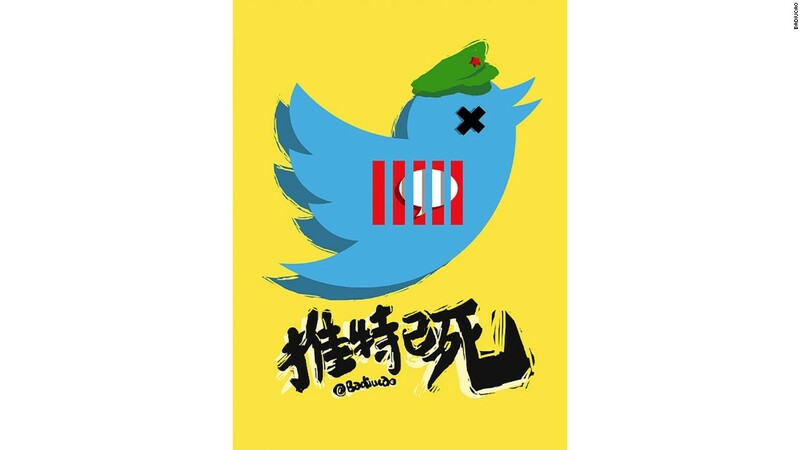 By now living outside China, Badiucao decamped to Twitter, from where his cartoons could still occasionally spread to the other side of the Great Firewall — China’s sprawling internet censorship apparatus — but there was no risk of account deletion. Freed from worrying about what Chinese internet users sarcastically call “harmonization,” his profile continued to grow. 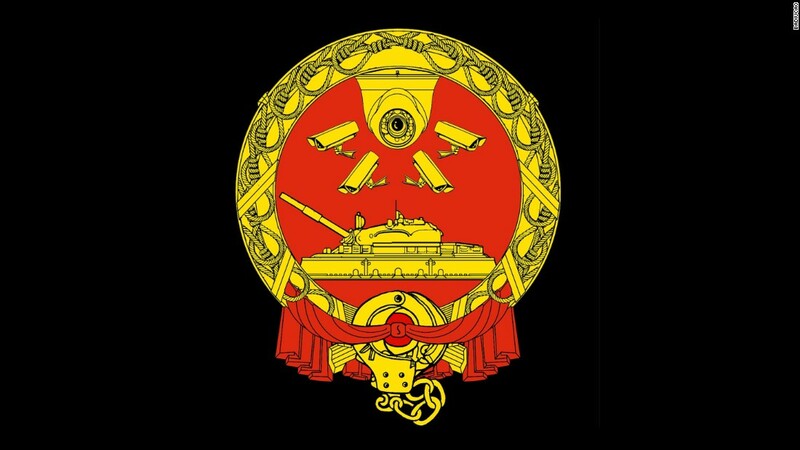 Badiucao’s cartoons meld the thick, blocky lines of German expressionism with the red-and-black punchiness of Chinese Communist propaganda posters. 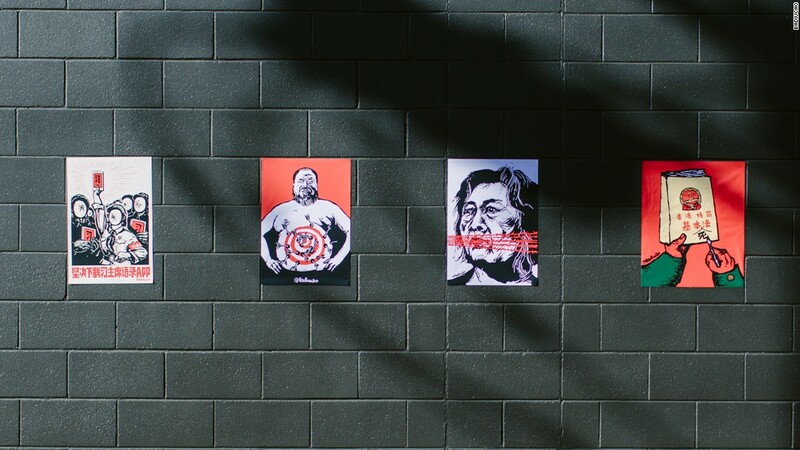 “When I first saw Badiucao’s work it resonated for me. It reminded me of Kthe Kollwitz’s woodcuts,” Canadian cartoonist Daniel Murphy said, referring to the early-20th century German artist. 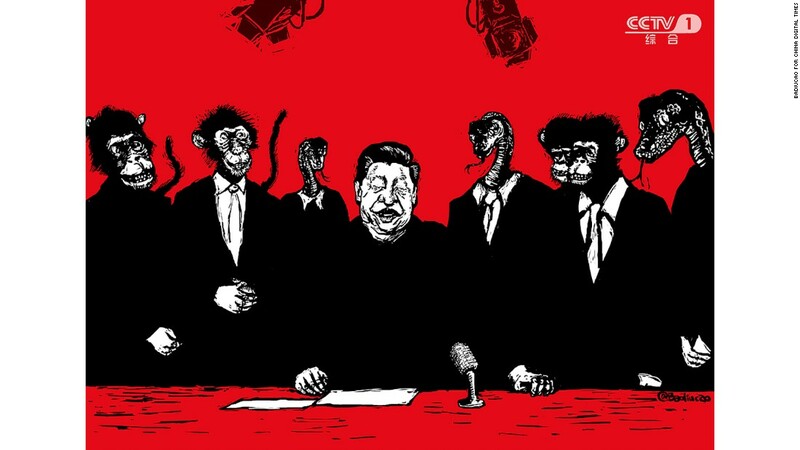 China Digital Times’ Beach said that Badiucao’s style lends itself to China’s often opaque online discussions. “Whereas a lot of the time people writing about politics in China use all this coded language, cartoons are a direct form of expression,” she said. 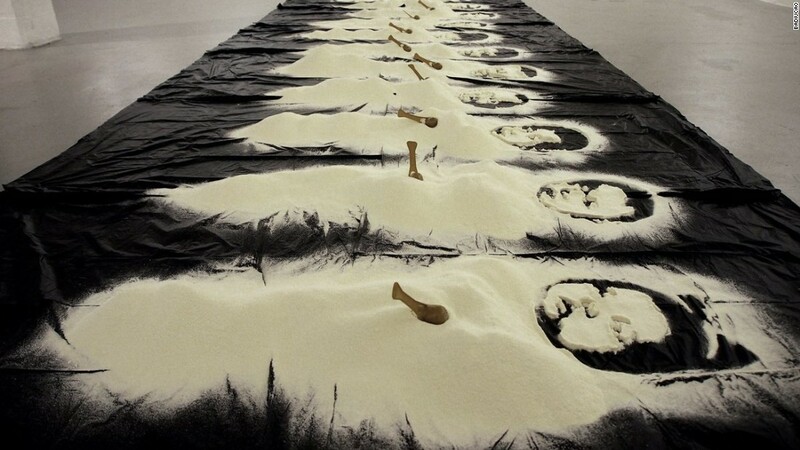 Beach compared Badiucao to China’s best-known dissident artist. “He has that same in your face manner as Ai Weiwei, of not caring what the authorities think,” she said. 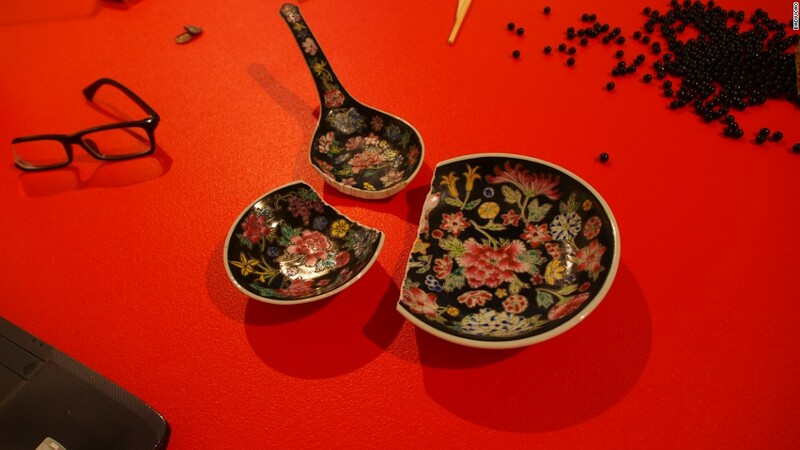 Outspoken Chinese artists often don’t fare well at home. Ai was put under house arrest in 2010 and detained by the Chinese government in 2011 in a separate incident for tax evasion, and has claimed he found government listening devices in his apartment. 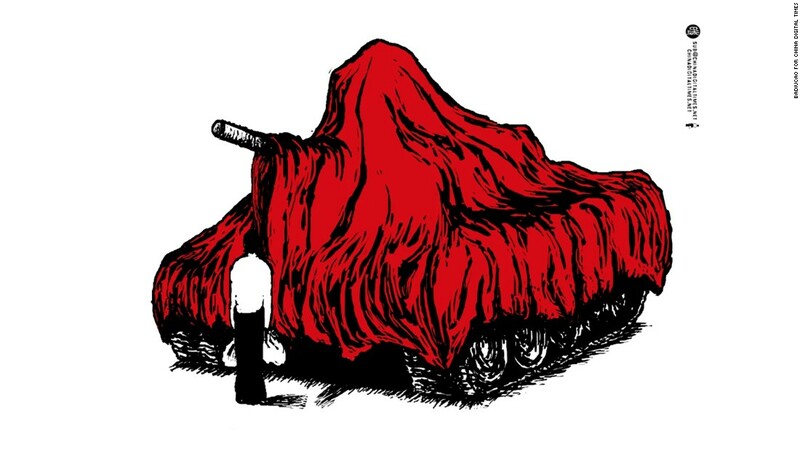 Like Ai Weiwei, Badiucao creates work in a number of different formats. 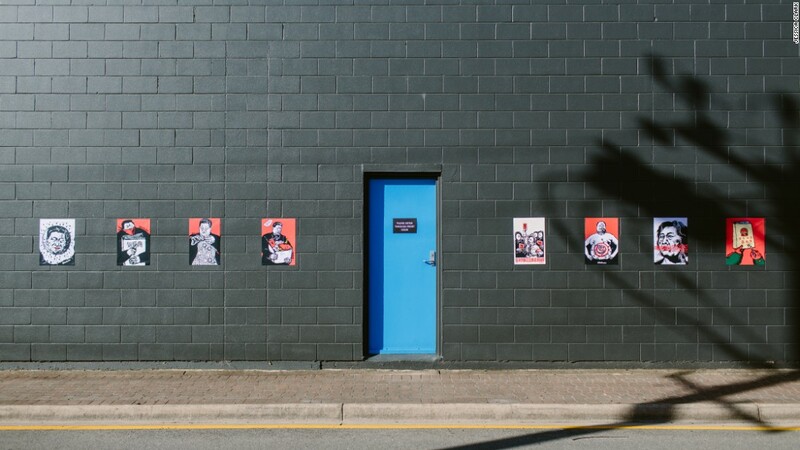 His first major art show opened in Adelaide, Australia, in September2016. 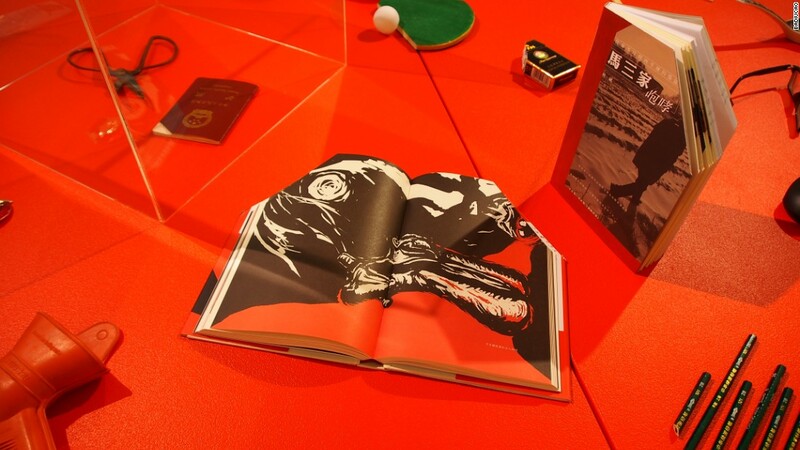 Opposite the powder, in a small glass case, lay the catalyst for the show, and Badiucao’s desire to push beyond his previous work. 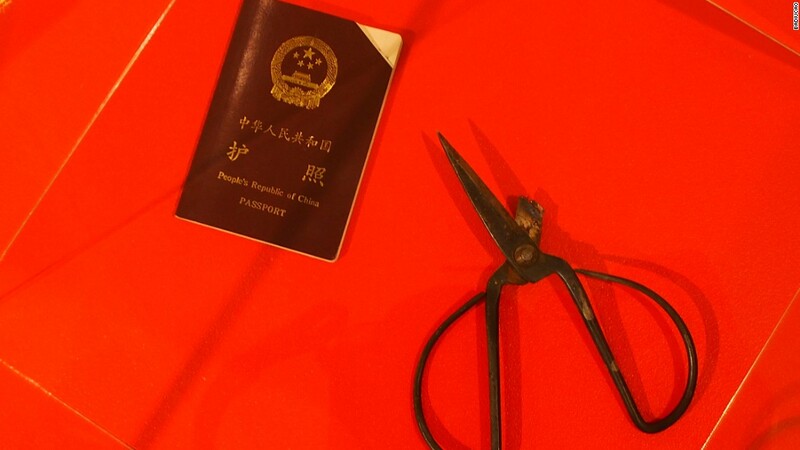 A passport, its dark red cover embossed with the emblem of the People’s Republic of China, with the top right corner sliced off. After years overseas, Badiucao is no longer a Chinese citizen. 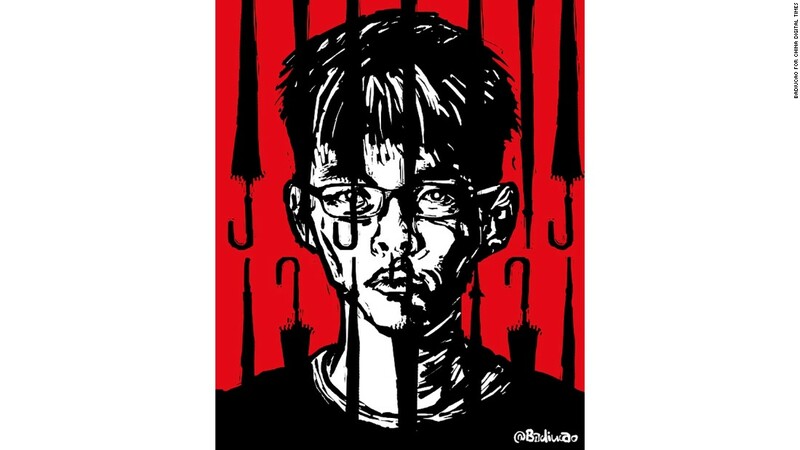 Badiucao’s parents hoped he would not be political. 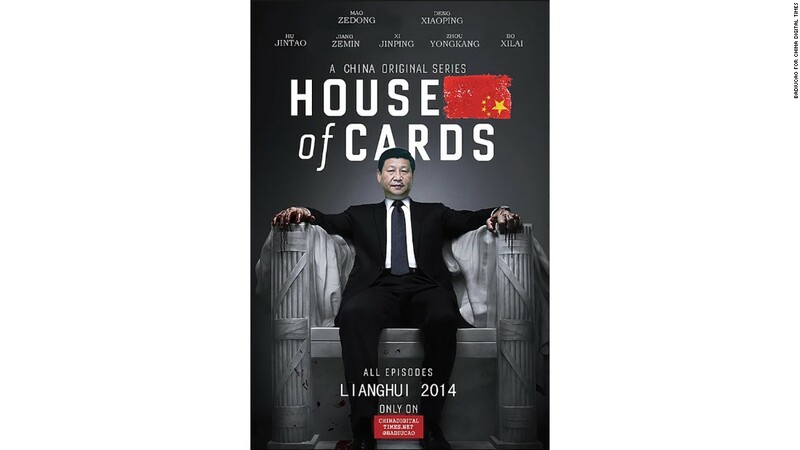 He said his grandparents were imprisoned during Mao Zedong’s Anti-Rightist Movement and his father grew up an orphan. 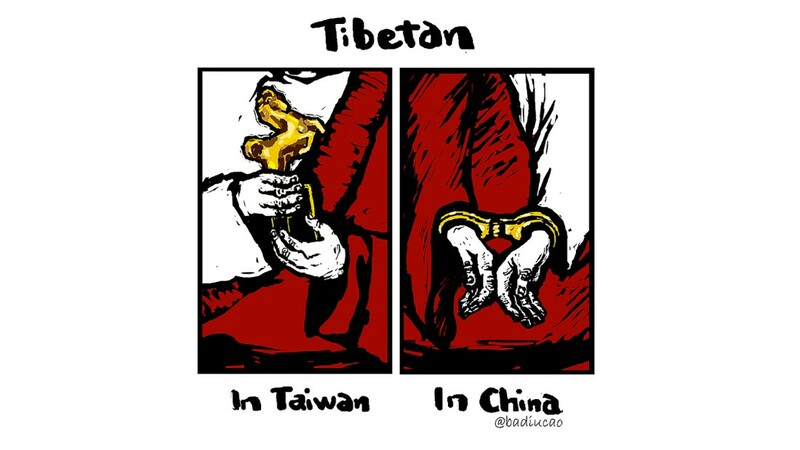 His parents encouraged him to be a dentist or hairdresser — “jobs that never get in trouble with the authorities” — but instead he went to law school, dreaming of joining the ranks of China’s incredibly brave and often arrested human rights lawyers. At university, a roommate acquired a copy of the 1995 film “The Gate of Heavenly Peace,” about the Tiananmen Square massacre of June 4, 1989. On the 2016 anniversary of the massacre, he re-created the famous Tank Man moment in Adelaide’s city center, standing impassively dressed in black-and-white, with shopping bags at his side and a mask covering his face, until security guards forced him to leave. 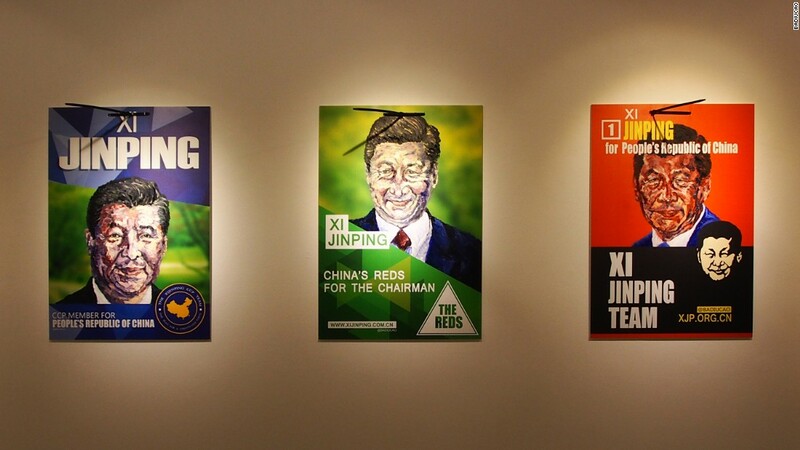 Even as he gets further away from the country of his birth — becoming an Australian citizen and getting more involved in local politics and issues — Badiucao has strived to maintain his relevance in China. 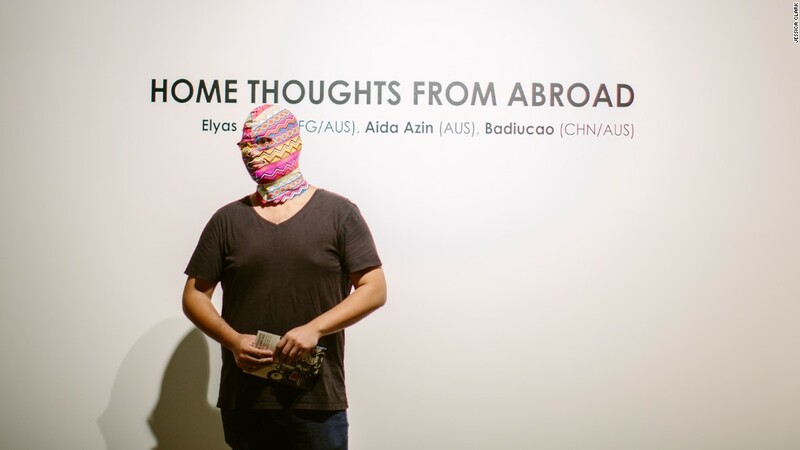 His latest show — “Home Thoughts From Abroad,” which ran until April 6 — is a collaboration with two other artists who exist at the crux of two countries, Afghan refugee Elyas Alavi and Filipina-Iranian Aida Azin. 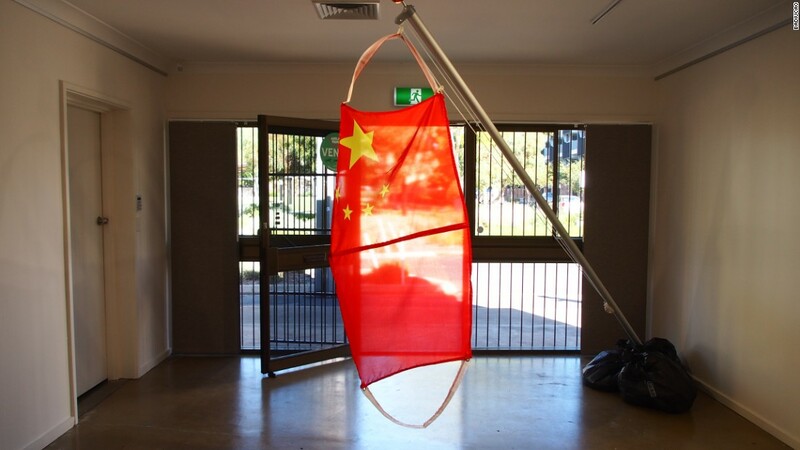 Badiucao’s contributions to the show include a selection of his political cartoons, a giant air-pollution mask made from a Chinese flag, and a bed (the first he ever slept on when he came to Australia), with the mattress replaced by 4,000 individually-sharpened pencils. 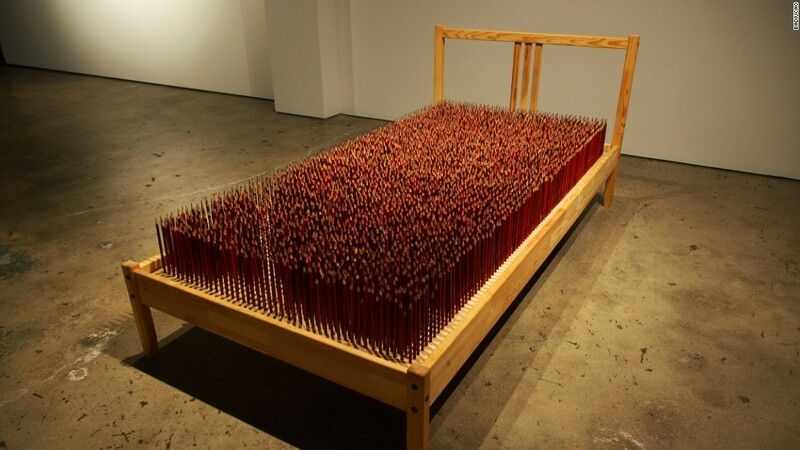 He sharpened all the pencils, ordered in bulk from a Chinese website, by hand. 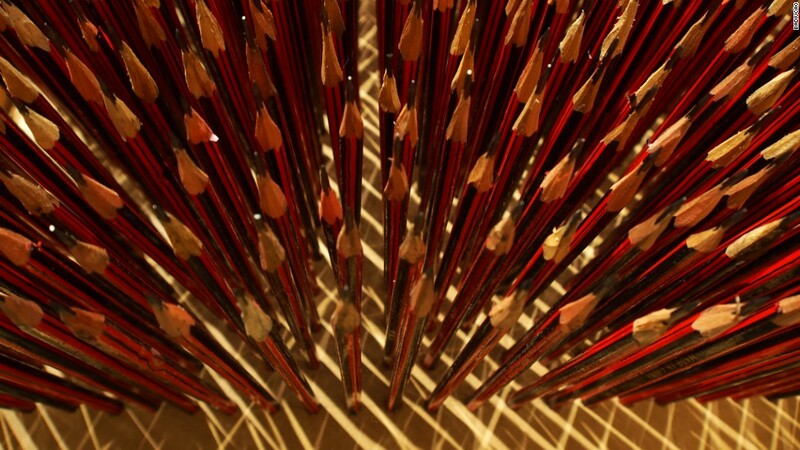 “First they were all the same, after I sharpened them, I gave them individuality, made them different,” he said. 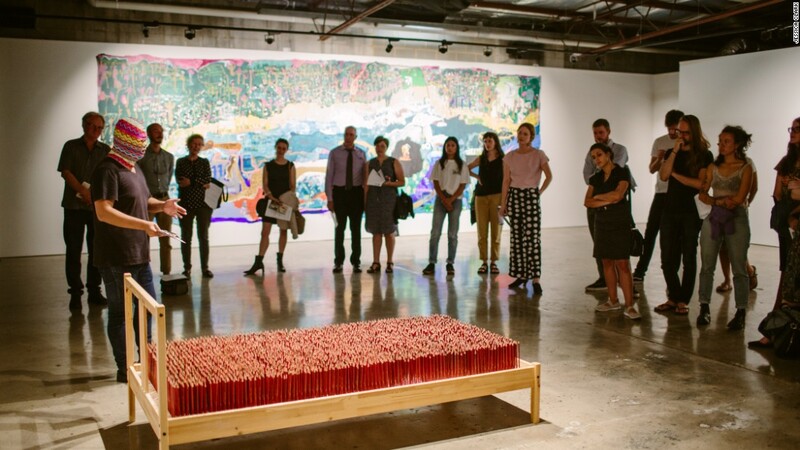 While Badiucao’s installation work is based on his cartoons, curator Joanna Kitto said that creating 3D versions of the work added a layer of complexity not always visible in print. “Cartoons must be very direct in the way they speak about issues, when you (create installations) you need to leave a degree of space for the audience,” Kitto said. 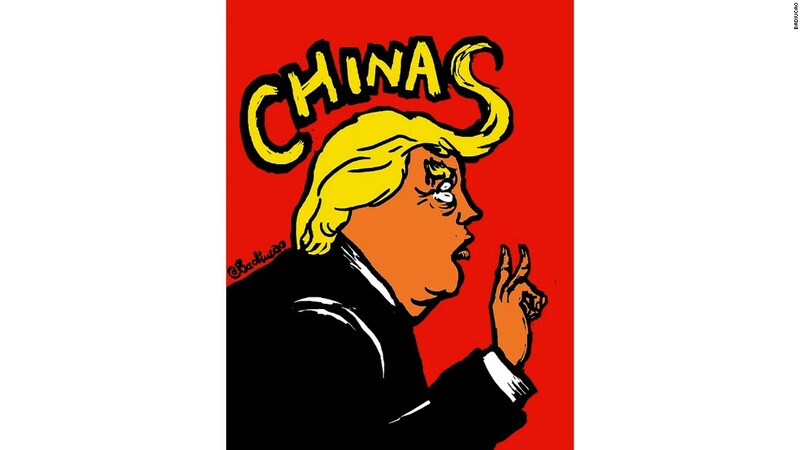 Badiucao agreed. “People can feel that cartoons are exaggerations,” he said.